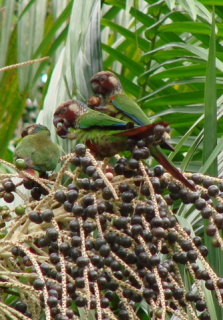 Pyrrhura conures have more swift, undulating flight, whereas Aratinga conures' flight is more straight and direct. Both adults mainly green; brown crown to nape, with strong blue wash on forecrown; hindneck with blue collar; brown/purple thin frontal band area around eyes and lores to upper cheeks; dull blue lower wash on cheeks; off-white ear coverts; green breast and throat with off-white and dark brown barring; brown/red centre of abdomen and patch on lower back to upper tail coverts; red bend of wing; maroon tail. Bill brown/grey. Eye ring pale grey/brown. Eye brown/orange. In general duller than adults, with fainter barring on breast; red abdominal patch has scattered green feathers. Cere and eye-ring bare and grey/white. Calls made in flight are sharp and rapidly repeated three or four times. Also a high-pitched, staccato series of notes, and occasional single notes when perched. Fruits such as: apple, pear, banana, orange, cactus fruits, pomegrantate, mango, papaya, forming up to 30 percent of the diet; vegetables such as: carrot, celery, green beans and peas in the pod; fresh corn; green leaves such as: Swiss chard, lettuce, sowthistle, dandelion, kale, chickweed; spray millet; small seed mix such as: canary, millet, and smaller amounts of oats, buckwheat, safflower and a little hemp; soaked and sprouted sunflower seed; cooked beans and pulses, boiled maize and complete kibble. Are avid chewers so provide plenty of bird-safe, unsprayed branches of fir, pine, elder, willow or saskatoon; wooden block toys, vegetable tanned leather chew toys, push and pull toys, foraging/puzzle toys, swings, ladders and ropes. Also enjoys bathing so provide overhead misters or shallow water bowls. Vertical box 20cm x 20cm x 70cm (8 x 8 x 28 in). This species has declined significantly within its Brazilian range due to deforestation. May be impacted by trade. E Brazil, from S Bahia south to Espirito Santo and E Minas Gerais, and formerly Sao Paulo; introduced to Rio de Janeiro Bontanical Gardens without success. Found up to 600m (1968 ft) in forest, forest edge and adjacent clearings with scattered trees including naturally shaded cacao plantations and sometimes entering villages. Feeds on flowers, fruits, seeds, insect larvae and algae. Seeds include Apirira guianensis, Cecropia glazioui, C. pachystachya and C. hololeuca. Social; usually seen in flocks of 15-20 individuals. Stays mainly in upper stages of canopy. 5-9 (captivity) broadly elliptical eggs, 26.5 x 20.5mm (1.0 x 0.8 in).